You may have at this page University of Science & Technology Bannu Jobs 2019 KPK Latest. The positions of Registrar, Controller of Examination, Treasurer, Director Administration, Director P&D, Additional Director Administration, Additional Treasurer Accounts, Additional Director P&D, Additional Director Academics, Provost, Deputy Registrar Establishment, Deputy Director Works, Deputy Treasurer Accounts, Deputy Director Administration, Assistant Director P&D, Webmaster, Programmer, Network Engineer are vacant. For more details, visit www.ustb.edu.pk. The last date to apply is 11th March 2019. 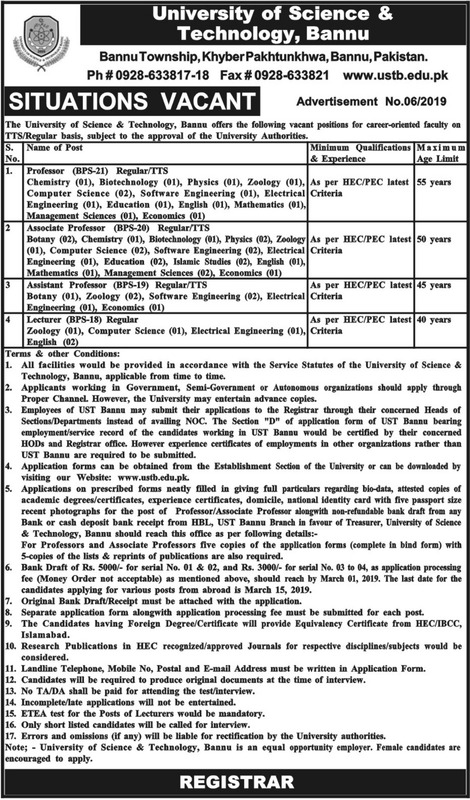 The job advertisement of University of Science & Technology Bannu is published in Daily Aaj and Daily Mashriq dated 8th February 2019.
with complete details are available here for desirous individuals. The is offering the jobs which belong to . The working hours are as per routine i.e. 8 hours a day and 40 hours a week. The job location is . The persons meeting the requirement of vacant post(s) may enjoy salary of . The most important thing is that the applications must be complete and should receive upto . The advertisement of contains complete information about job specifications, job description etc. which is published in dated February 8th, 2019, Friday.